You’re used to my crazy contraptions by now, right? If you’ve been following my blog for a while, you already know about the under floor storage, the crazy aluminum bed, the refrigerator on wheels, among other things. Well, here’s one more crazy item. It’s a bed/lap desk with a stand for a second monitor. I haven’t put legs on it yet—that’ll come later. Believe it or not, no one makes anything like this. They only make regular desk-mounted and wall-mounted monitor stands. Nothing for bed or lap desks. Are you telling me that everyone in the world who has ever needed a second monitor as part of their computing setup has resigned themselves to sitting in a chair at a table? That’s just crazy. And don’t get me started on those standing desks—you know I wouldn’t last even five minutes at one of those if I’m building stuff like this just so that I can work from my bed. Anyway, why would a small project like this matter to you? Because you could probably steal bits and pieces of my project for your own project. Honestly, as a bed desk it’s not ideal. It’s really heavy when it’s fully loaded up with a monitor and a laptop, so that’s not great. But what is pretty darn cool is the way it’s put together. I used a combination of plywood, Ram mount accessories, and a VESA mount. 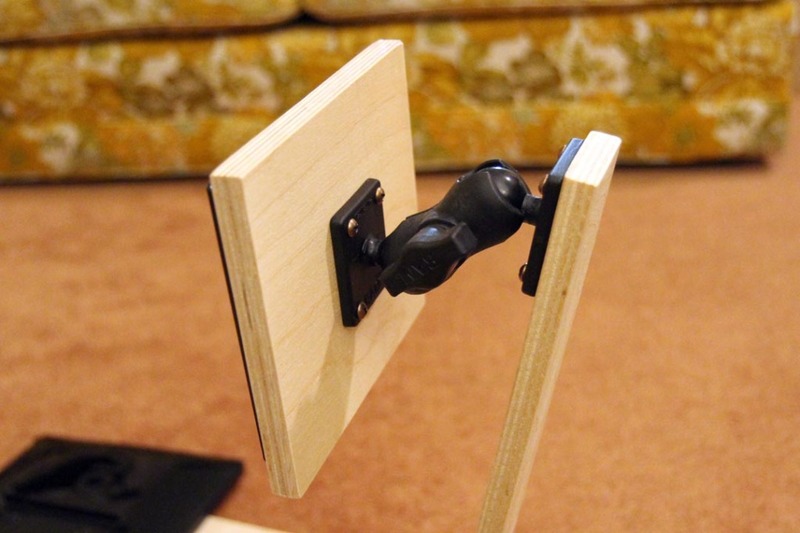 You can use these same doohickeys to mount a similar monitor to the wall of van, to the ceiling, etc. First, let me tell you about the monitor. The monitor I’m using is an AOC e1659Fwu (who the heck names these things?). It has three super awesome things going for it: it weighs a scant 2.4 lbs, it’s USB powered (doesn’t need a discrete power cable), and it has holes in the back for a VESA mount. However, the resolution is only so-so, every unit appears to come with at least one dead pixel, and the color depth isn’t as good as my Mac—but these drawbacks are only significant if you work with graphics. I would bet that for most people, the pros of this monitor would outweigh the cons. 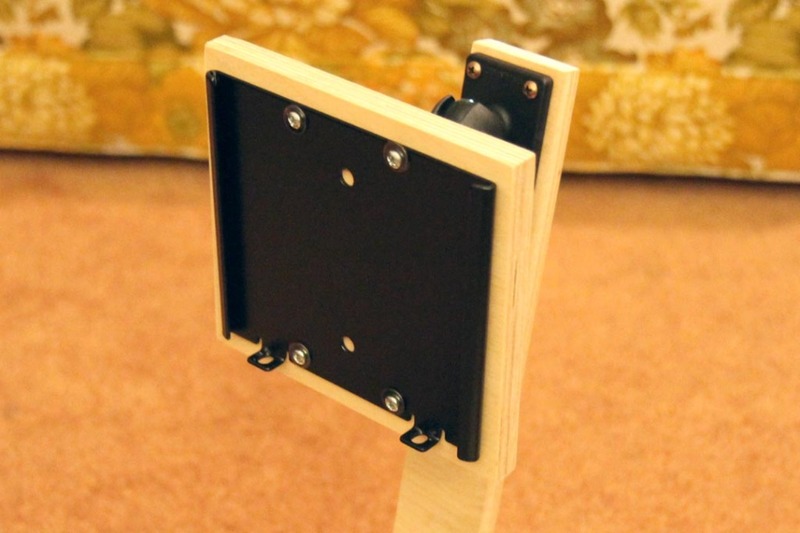 The monitor is attached to the stand via an ultra thin VESA mount bracket. I attached one side of the bracket to the monitor, and the other side to a small piece of wood. The piece on the back of the monitor slides into the piece attached to the wood, so attaching and detaching the monitor is as easy as sliding the two bracket pieces together. After gathering all the pieces, it literally took less than 15 minutes to screw the balls in place and connect the sockets. Easy peasy. And because the Ram mount system is so customizable and adjustable, I can now mount a single Ram 1” ball inside Gypsy, disconnect the arm from the desk, and hang my monitor from Gypsy’s ceiling. Pretty cool, eh? Stick to mounting things that weigh 3 lbs and under, as these small Ram mount accessories were meant for mounting cell phones and GPS units to dashboards. If you want to mount heavier items, Ram does make heavy duty mounts, and you can peruse their products here. Double socket arms come in a multitude of lengths and materials. 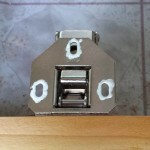 The ones with a spring inside are better for the points where you’ll be connecting and disconnecting often, because the spring holds the socket to one of the balls like a clothespin, and that way it won’t fall off when you disconnect the other side. It’s hard to explain, maybe I’ll do a video soon. So there you have it. The Ram mount balls were about $7.50 each, the short double socket arm was about $7.50, and the longer one was about $10.50. 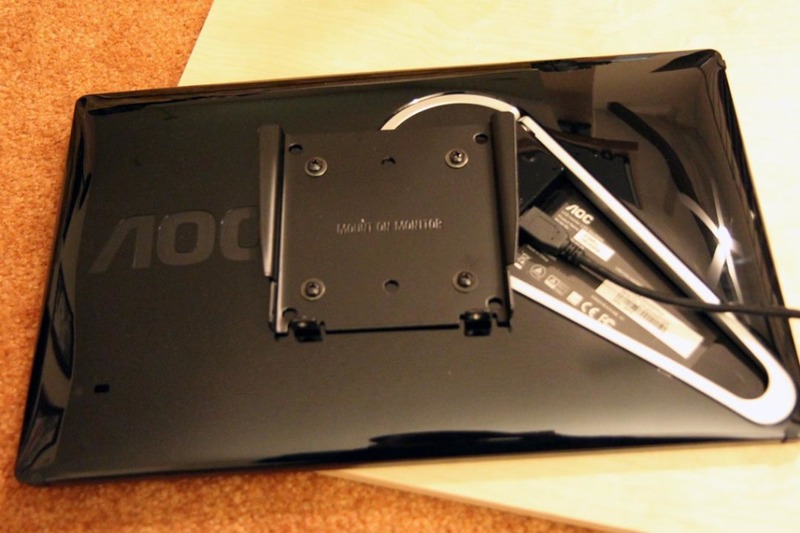 The VESA slim mount plate was about $12. The wood was leftover from other projects. The total cost was about $60. It was more than I wanted to spend on this project, but in the end I think it was worth it. 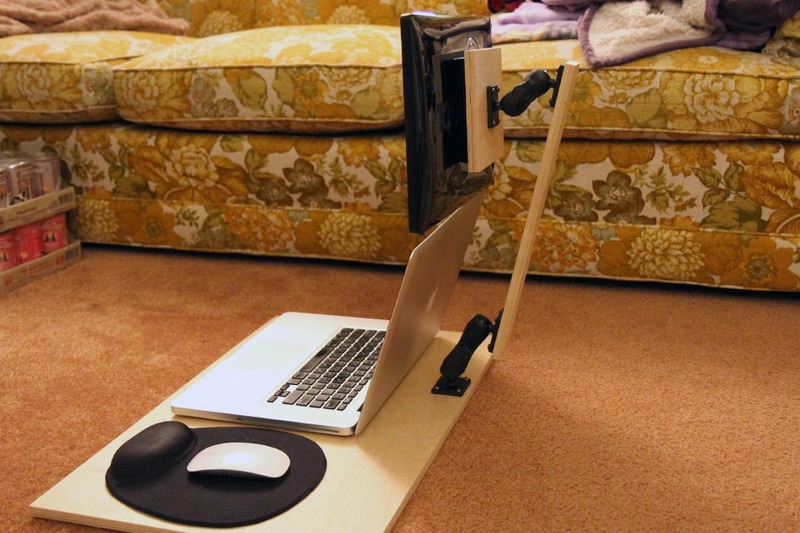 The stand has ultimate adjustability, flexibility, and portability. Plus, it has one other benefit that many other stands don’t: you can lock your gadget into a precise viewing angle. 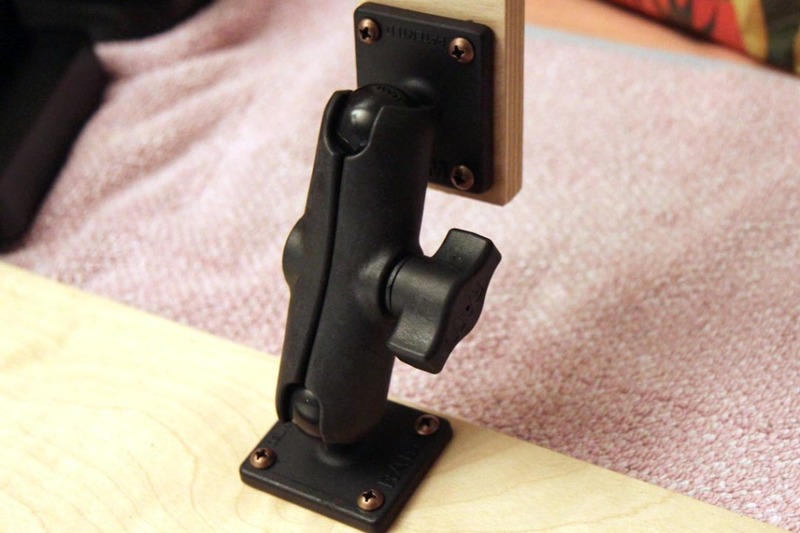 That’s not a concern for house dwellers whose walls stand at perfect 90 degree angles, but for van dwellers whose “houses” might list to one side, a stand or mount that won’t let your gadget slide out of optimum viewing angle is much appreciated. Things have been fairly quiet around the blag for the last couple of weeks due to the mountain of design work that I’ve had to tend to—not that I’m complaining, it’s actually a super fun project and I get to work with some really nice people. But yeah, it’s definitely cut into my Gypsy time. The good news is that the weekend is coming, and since I’ve been operating on a typical 40-hour workweek, I think I just might be able to make a little progress on Gypsy this weekend. Fingers crossed, anyway. Here are Amazon links to the stuff I used for my stand. Full disclosure: these are Amazon Associate links. If you buy something from Amazon using one of my links they throw me bone (like $0.04), but don’t worry—it doesn’t cost you anything extra.